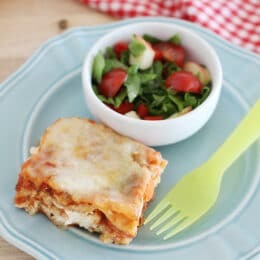 This vegetable lasagna is flavorful, hearty and perfect for a weeknight meal where the veggies are already included! The biggest different in making a traditional meat lasagna versus a vegetable lasagna is just cooking the meat vs. sauteing veggies. Start by dicing your veggies and saute until tender. This step is important, because they likely won’t cook to a texture that is expected in a lasagna if you don’t saute them first. We like to then add the marinara sauce to the veggies and let the flavors combine in the saute pan for a few minutes. The rest is just like lasagna clockwork. We prefer cottage cheese to ricotta, especially in this vegetable lasagna recipe because cottage cheese has a lot more protein and flavor than ricotta does. Also, if you are in a hurry, use no boil noodles. You can just layer them right in with your mixtures instead of having to get out another pan! 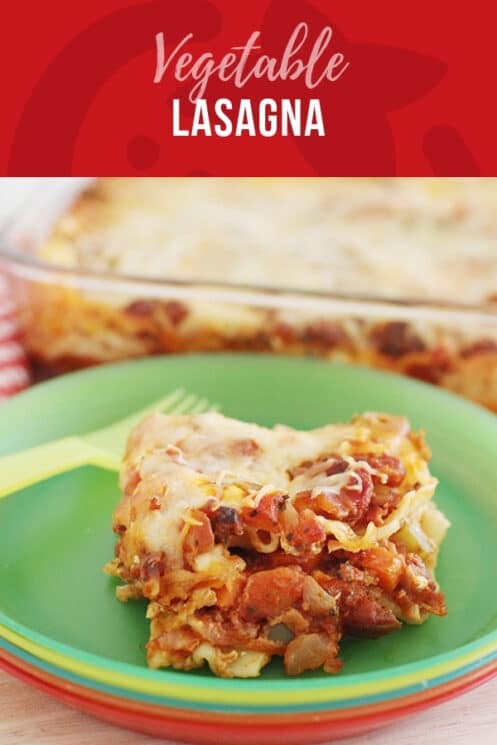 What Vegetables Are Good In Lasagna? The flavors and textures of the vegetables can change the overall taste profile of the vegetable lasagna. This is actually a good thing, because if your kids don’t like it the first time you make it, switch up the veggies and make it again! Can I Freeze Vegetable Lasagna? 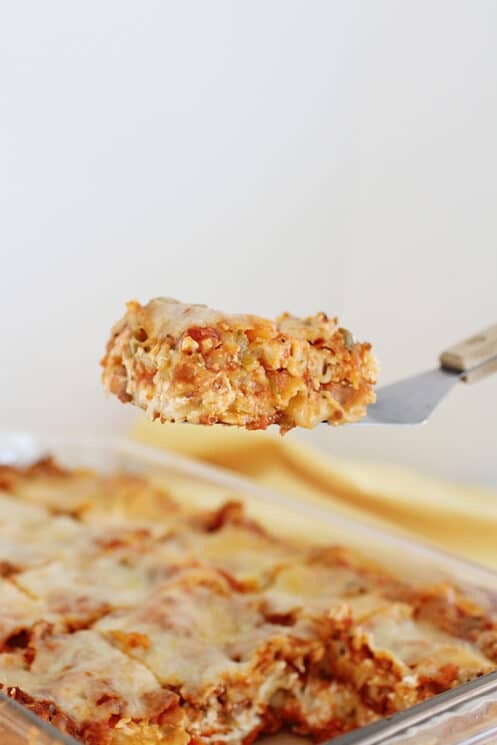 Assemble the lasagna in a dish that can be frozen. Most glass and ceramic dishes are good for freezing. 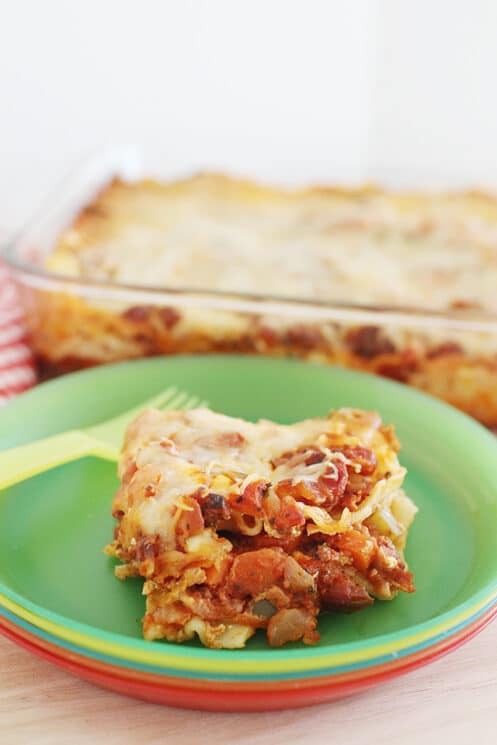 If you want to freeze the lasagna after it has been baked, let it cool to room temperature. The texture can get weird if you freeze it right out of the oven. Make sure you cover the lasagna with an airtight wrap and don’t leave any gaps. 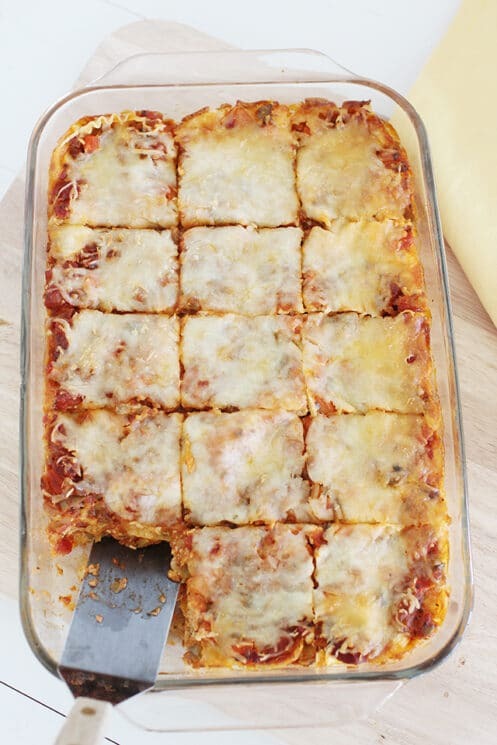 This helps prevent your lasagna from drying out or getting freezer burn. Before you bake your lasagna, remove the plastic wrap and cover the top with foil. This keeps the top layer of cheese from getting too brown with the rest of the lasagna cooks. Give it plenty of bake time before you are ready to eat, just in case it takes longer than you were expecting. Dice carrots, green pepper, and onion. Spray a skillet with cooking spray, heat over medium. Saute the veggies until tender. Add the marinara sauce and heat through. In a separate bowl, mix together cottage cheese, cream cheese, mozzarella (reserving a little for the top), Parmesan cheese, salt, and eggs. Spread 1 cup sauce mixture into the bottom of a 13×9-inch baking dish. Layer 1/2 each uncooked lasagna noodles, cheese mixture, and sauce. Repeat layers and top with remaining mozzarella cheese. Cover with foil and bake for 50 minutes. Remove foil for last 10 minutes of baking. I love this recipe, it’s so easy and great with cottage cheese! I throw in whatever veggies I have around (usually what’s listed plus mushrooms, fresh tomatoes etc) and make the sauce a little chunky. There’s never a wrong! Sounds yummy Kelly, thank you for sharing! Can you leave out out replace the egg? Hi Susan, I think it would be OK to leave out the egg. You might get a slightly different texture to your Vegetable Lasagna (it might not hold together quite as well) but I think it would still work.